It's always an exciting day when you get a Maybelline package through the post, but when it contains their newest mascara I can't help but squeal with excitement. I rarely stray from a Maybelline mascara because they're just THAT good, so I'm very thankful that Maybelline have sent me their newest Total Temptation Mascara and Brow Definer. I always have big expectations when Maybelline come out with a new mascara because they never usually dissapoint. The last new mascara I tried was the L'Oréal Paradise mascara and I really loved it, so I was secretly hoping Mabellline would come out with an alternative. I'm always up for full long lashes but I must admit, some mascaras can leave your lashes feeling a bit hard and stiff - so you really have to scrub to get the mascara off, which can be very harsh on your eyes! Total Temptation delivers gorgeous thick, long lashes whilst still feeling so soft to the touch! Total Temptation is enriched with coconut extract to soften the lashes - my lashes feel so soft and conditioned, whilst still looking full and thick! I've been loving the smell of this mascara it has a lovely coconut and vanilla scent, it's so much better than that synthetic chemical smell some mascaras have! I'm usually a lash sensational girl but I have to say, I think I'll be stocking up on this one from now on. I love the brush, the bristles are soft and full making sure they grab every lash. 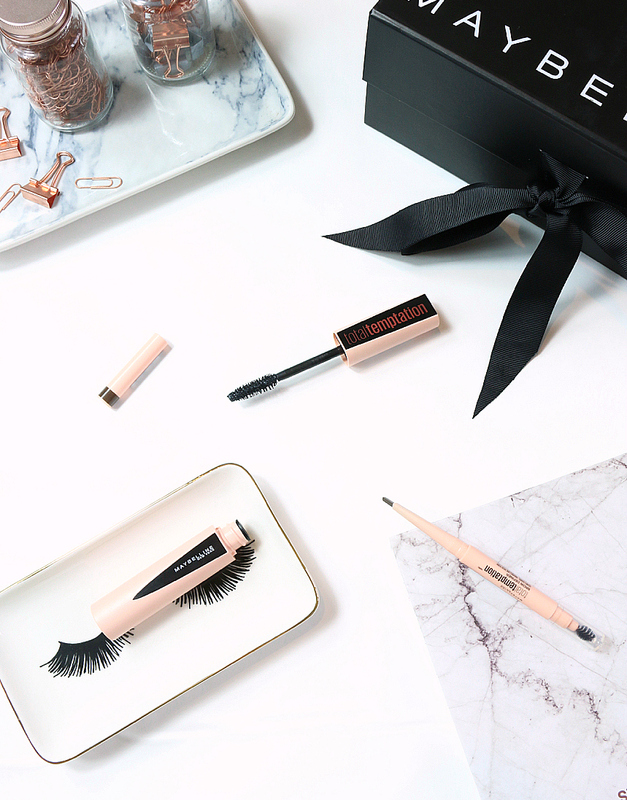 Total Temptation makes it so easy to get full, thick lashes whilst still being so comfortable - this is definitely going to be a staple in my make up bag from now on! One product that I don't usually test out a lot are brow pencils. Once I find one I like, I usually stick with it for a long time. Never the less, I was still intrigued by the new Maybelline Total Temptation Brow Definer. The definer ticked the most important box for me at first impressions - it has a brush! I can't stand when a brow product doesn't come with a brush, I like to brush my brows before and after applying to blend in the product and neaten up my brows. The brush is a fluffy teardrop shape that I hadn't tried before. I'm not sure what the benefits of this shape are compared to a normal brush, but it does do the job. The brush is also very soft which is very nice, there's nothing worse than a hard brush that is almost painful on the brows or rips your brows out! The pencil itself is much like the Benefit Goof Proof. It has the same angled shape. I like to use the tip of the definer for the narrow parts of the brow like the tail of your brow and the angle base of the pencil to fill in my brow. The formula is so creamy and so easy to use compared to Benefit's Goof Proof that feels much rougher on the skin. This pencil is perfect for creating full but natural looking brows, it's a perfect everyday pencil - with a brush woohooo!! Thick, full lashes no longer come with the heavy weighted eyes, you can now have full beautiful lashes that feel light and soft to the touch thanks to the Maybelline Total Temptation Mascara. Have you tried anything from Maybelline's new Total Temptation range yet beauties? I've been loving the look of this mascara - it's currently on my Wishlist! Oooh you need to try it, it looks amazing and feels so lovely to wear!